Sara called me from Bierkraft to ask if there was anything I wanted. 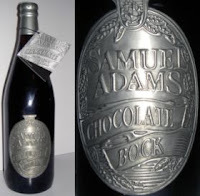 I asked them to look for Sam Adam's Chocolate Bock, preferably in one of the growlers. I've had this beer a couple of times, and it's delicious. Occasionally I find it in 750ml bottles, but when I first had it at Croxley Ale House, it was on tap and delicious. They also have some of the best wings I've tasted outside of Buffalo. They don't have the beer anymore though, and I have yet to find it on tap anywhere else. Sometimes I pop into a bar I've never been before, just hoping they'll happen to have it. They never do, but I have discovered some other tasty drinks this way.